The last field trip of this Master Birder Certification Program is a bird banding field trip led by Charlie Muise (Georgia IBA Coordinator). Time: 8:00AM - 12:00 Noon. It was a cold November Saturday morning and I left house at 6:55 am in order to arrive the banding site by eight. This was the first time for all the new master birders witnessed a half day bird banding event. American Kestrel, a great catch of the day. It is a hatch-year bird, female and banded. We have spotted total 40 species and banded Song Sparrows, Field Sparrows, Sannvanah Sparrows, Swamp Sparrows, Northern Mockingbirds, and one Amercian Kestrel, a great catch of the day! We have also seen over 150 of Balck Valtures and 2500+ of Red-winged Blackbirds. Charlie was very happy to catch this Kestrel first time at this banding site. Apprently, this young female Kesterl tried to chase her prey, a sparrow, and both got caught in net. See Trip photos here or slide show below. We have also caught two Northern Mockingbirds. They were all hatch-year birds and banded. I took a shot when the Mockingbird closed his eyes with nictitating membrane. Birds can still see their surrounding with their nictitating membrane temporarily closed. This membrane functions well especially when birds are in flying to block out dust. Click bottom right corner to see detail of each photo. 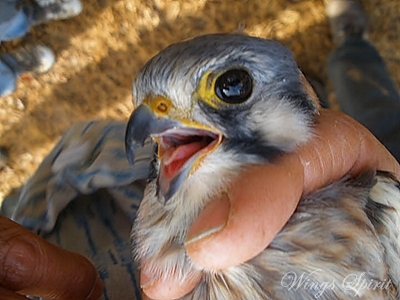 See clip of banding American Kestrel here. See clip of banding Northern Mockingbird here. See clip of banding Song Sparrows here.